Let us introduce you to our talented, friendly, and experienced staff. Brenda graduated from Louisiana State University with a Bachelor of Fine Arts degree in dance. She is registered with the professional organization Yoga Alliance and is a certified RYT 200 Yoga Teacher. Brenda has performed with the LSU Dance Theater and Ballet Ensemble, the USL Repertory Dance Concert and Moving South Dance Company. She served as director of the children’s ensemble for the Moscow Ballet’s performance of The Nutcracker. Brenda has worked as a choreographer for numerous theatrical productions including the Acadia Players productions of Godspell and Cinderella, Notre Dame High School’s production of Annie, Burin Martin’s Southeastern Theatrical Company musicals and St. Michael Elementary School’s annual Faith Rally. She also works with the senior citizen dance group, The Silverbelles. Brenda was recognized as the Outstanding Citizen in her vocation, was the recipient of the Crowley Rotary Club’s Vocational Service Award and has served as the choreographer chairperson for Dancing with the Stars of Crowley. She is an active member of the Grand Opera House of the South's Board of Directors. Kaitlyn's choreographic capabilities have earned her numerous awards, and her work has spanned stages throughout Louisiana and beyond. She expanded her contemporary dance experience at the 2018 Batsheva Gaga Dance Workshop in Israel and the Soul Escape 2017 summer intensive in Dallas, TX. Kaitlyn loves to express herself through gestural movement and dynamic musicality. She wants to dance with others, to inspire artists and audiences through passionate movement that focuses on honesty and raw emotion with a strong backbone of training. Kaitlyn began dancing at the the age of 7 with Dance Connection of Abbeville, LA. She competed from ages 17-20 with New Iberia's Studio 84, winning numerous awards - including Magic Performer of the Week at LADM. While attending high school in Erath, LA, Kaitlyn's passion for movement expanded to contemporary - a style she found she could identify with. She is currently studying Interior Design and Architecture at the University of Louisiana at Lafayette. Brianne has danced at Core Dance Center since she was 3 years old and has been an active member of the studio throughout her high school and college educations as a studio assistant, founding member of The Company and now an instructor and choreographer. She is a Blackbird Oiseau Noir Dance Company member and received a tap Scholarship to the Dancer Palooza Intensive in Long Beach, California and a scholarship to Dance League Convention. 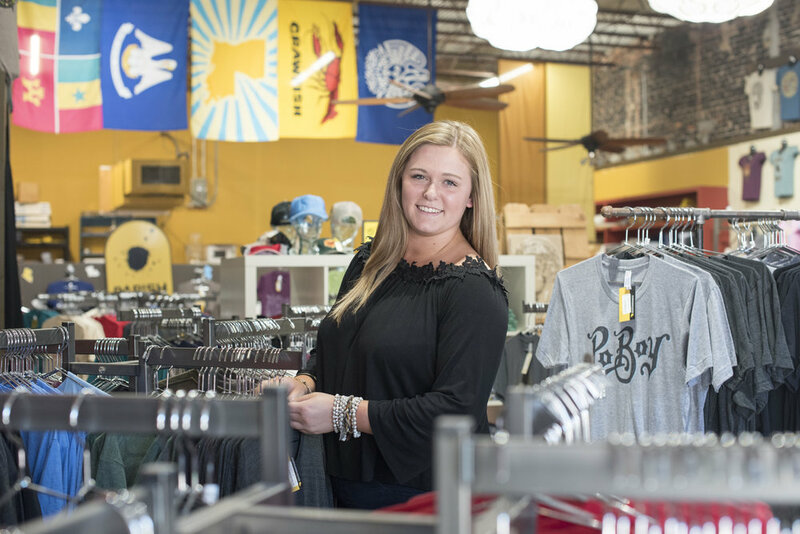 She began her college education in the Fall of 2016 majoring in Nursing, is part of the LSUE Honors Program and Phi Theta Kappa Honors Society. Paige Barnett is an active dancer, choreographer, and filmmaker in Lafayette, LA. She is currently a Basin Dance Collective company member and has performed as a guest artist for ULL Lafayette Performing Arts, Acadiana Symphony Orchestra, and Paul and Lulu Hilliard Museum. In January 2018, Barnett directed a collaborative visual arts and dance film, “Delicate Things”, which was selected to be screened by NYC's NACHMO Film Project. She also recently co-directed and choreographed a dance film that won an “Official Selection” for the 92Y Mobile Dance Film Fest, sponsored by 92Y Harkness Theater in NYC. Barnett has lately begun her career as a performance art director in the rework of Tina Girouard's “Mardi Gras Suites and Quartets” at Acadiana Center for the Arts; she is currently transferring the piece's performance medium into a short film, alongside JD Mahoney of MagicBusTV. Barnett has professionally studied dance under the direction of Banning Bouldin of New Dialect, Clare Cook of Basin Arts, Shannon Gillen of Vim Vigor, John Heginbotham of Dance Heginbotham, and Christina Noel Reaves of ChristinaNoel&TheCreature. She has been teaching ballet for a decade in the Acadiana area and is looking forward to expanding her knowledge and excitement of ballet with the students of Core Dance Center. Natalie is currently enrolled at the University of Louisiana at Lafayette as a Performing Arts major with a concentration in Dance. She is trained in classical ballet and modern technique. She is an active honor society club Chi Tau Epsilon member and has served as Historian and is currently serving as Co-President. Natalie's dance training began at 3 with a focus on ballet. By middle school, she trained in jazz, lyrical, contemporary, hip hop and tap. In high school, she began serious technical and performance training at Core Dance Center from 2014-2017. She was also a founding member of the CDC competitive company for 2 years. She received an assistant/instructor position at Core Dance Center from 2015-2017, as well as a former assistant position at Blue Birds Ballet Academy in Lafayette, LA. Jaci is a 20-year-old Kinesiology student at the University of Louisiana at Lafayette. She danced began dancing at the age of 10 and went dance competitively from age 15-18. Jaci has received numerous scholarships from conventions such as Jump and LADM. She has also trained as a company member for The Streetz Dance Convention, LA Dance Magic, and has assisted intensives such as Distinction. After high school, she began choreographing and teaching in various styles including Jazz, Lyrical, Contemporary, and Hip Hop. Jaci performs and teaches because she loves sharing the gift of giving through the art of dance and being able to make people feel something. She is grateful to have the opportunity to inspire and encourage other dancers to find themselves in their artistry!